Funny shades pallete. Full HD 50p slow motion. 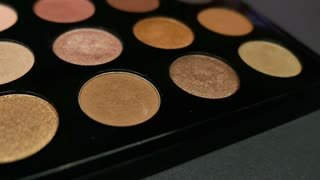 Close up shot of a dirty pallete on the table by the window. 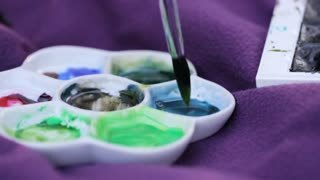 Different colors on a pallete. Working instrument of a painter. 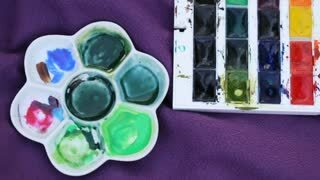 Close of colorful pallete with different enamels for ceramics. Pieces of clay with different colors are hangling on wooden stand in a rows and showing the opportunities to decorate the loam creatures. Close up of white foam is being added to the dough in metal bowl. Female confectioner in latex gloves is holding yellow pallete and mixing for cake cooking with butter, sugar anf flour paste. Woman hands putting cream on a sponge cake by hand using pallete knife. Woman putting cream on a sponge cake by hand using pallete knife.